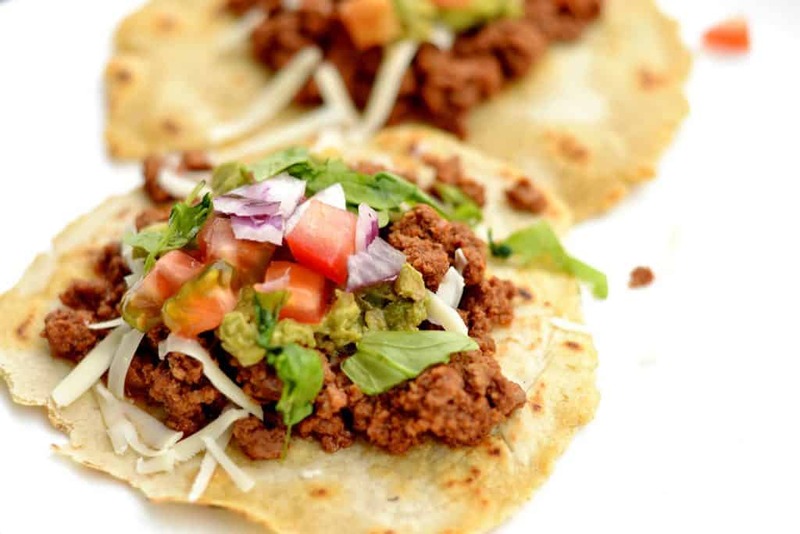 Make Taco Tuesday your favorite dinner of the week with this super easy and delicious ground beef taco recipe! 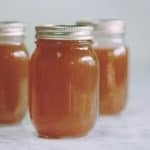 Can be made in the Slow Cooker or Instant Pot! 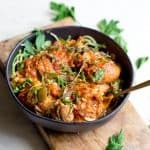 *Recipe has been updated with Instant Pot directions. If I have somehow given anyone the impression that dinner time around my house is always quiet with happy compliant kids eating every morsel on there plate, I guess I should paint a picture of what reality is around the table. Often times my kids like to negotiate. Something like, “If I eat just one more carrot can I be done? Do I really need to try those tomatoes? How about if I eat everything I get some chocolate?” I am sure it sounds familiar to you. There is an exception to this banter. It’s called taco night. We often joke that it’s the quietest dinner night in our house. The kids are so happy with their food, they don’t make a peep. The plates are always clean, often there are seconds, sometimes thirds. It’s perfect really. I should just consider eating them every night. 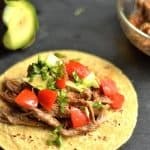 I have a few different variations on tacos, but I love the simplicity and “easy button” of the slow cooker. 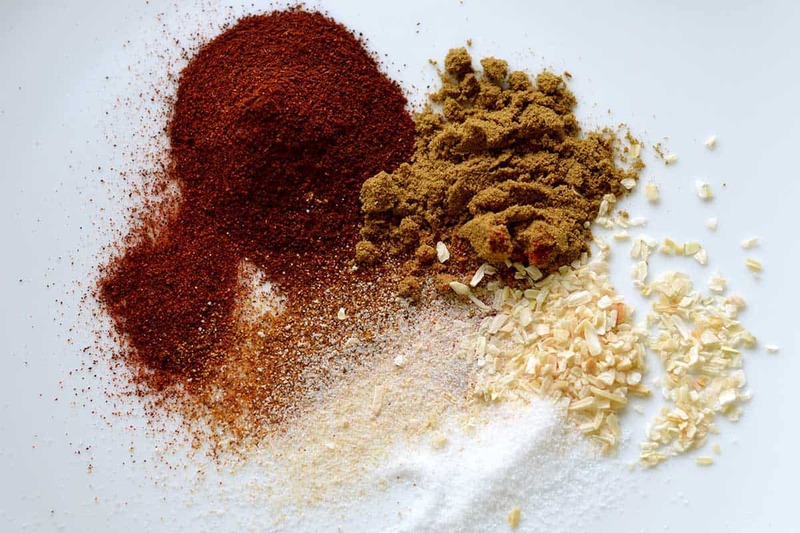 My homeade taco seasoning is simple and you probably have everything in your pantry. I do like to add some chipotle powder (surprise surprise), but this is definitely optional. You can easily double or triple this recipe for taco seasoning and keep it in a jar to use for future taco nights. This recipe is so dang easy that you may just be adding taco night as a regular dinner around your house too. I mix up the spices. I add ground beef, tomato paste, and onion to the slow cooker. I then add the spices and top with a little chicken broth. Done. Easy button. Dinner is ready in about 4-6 hours. Don’t forget all of the fix ins. Tacos are best served with tomatoes, lettuce, cilantro, onion, sour cream, avocado, and I do love me some hot sauce and salsa. Mix the ingredients for the taco seasoning in a small bowl. Add ground beef to your slow cooker. Top with onions and tomato paste. Finally add in chicken broth and vinegar. Stir the mixture around to coat most of the meat. Cook for 4-6 hours on low heat. Serve with your favorite tortillas, and any other taco toppings. Begin by selecting the saute function on your Instant Pot. Once pot is hot, add in a few tbsp of your favorite cooking oil (I use avocado), then toss in onion. Cook for 2-3 minutes. Add ground beef to the onions and saute for 2-3 minutes more. Meat will be browned but doesn’t have to cook all the way. Select cancel. Mix together your spices in a small bowl, and toss in the slow cooker. Add broth, vinegar, and tomato paste. Secure the lid. Select the manual function and cook for 7 minutes. Use a quick release. Once steam has been released, open the lid. Stir and serve over taco shells or in a salad. Hello, How many tacos can be made with this receipe? Hi April, this recipe makes a lot of tacos. 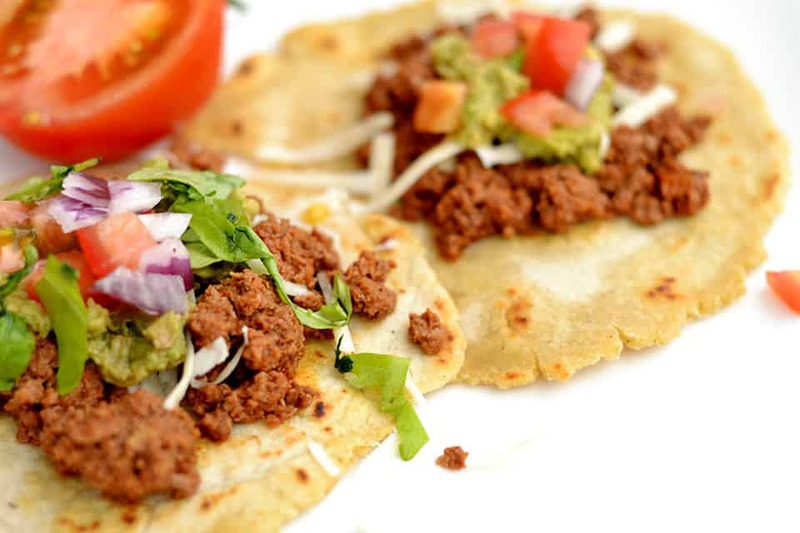 It all depends on the size of your tortillas, and what else you fill your tacos with, but anywhere between 12-20. Nope! That’s why it’s so easy. You can put in the crockpot without browning it first and will cook properly. Once the ground meat is done. Can I drain the grease or the fat? Were trying to better are cholesterol lol. Yes, I would skim the fat off the top while it’s in the crockpot. You can also use ground turkey in place of beef! 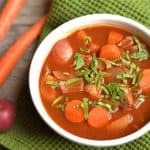 Could I use vegetable broth instead of chicken broth? Would it really change the flavor? Yes, you can absolutely swap the broth! 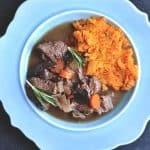 If I were to double this recipe, would it affect the cooking time? If so, do you know how much it would be affected? Cooking time will still be the same! Right around 4 hours. Hi there! 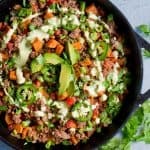 Would I be able to use pre-made bulk taco seasoning? How much would I use? Sure Linsey!! I would use about 1/3 of a cup. Once cooked through, taste it to see if you need to add a bit more. Are you cooking on low or high heat? Hi Reba, I like to leave the fat, but you can certainly skim the fat off the top! It will still be plenty flavorful. I also use ground turkey with this same recipe and it tastes great! What do you think about adding bell peppers? Would it get too soggy? 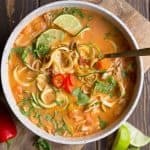 Less broth because of the juice from the bell peppers? Sure, I think if they were diced it would add nice flavor! Delicious! I did add a can of green chilis and some adobo sauce for some added heat but definitely would’ve been just as good without. 🙂 hubs had his in a tortilla, the boys had theirs over organic corn chips with toppings, and i had mine in a lettuce wrap. love love love. thank you! How much meat do you think I would need for 16 people? I’m curious as to the tortillas you used in the picture. They do not look like boring ole store bought ones. Do you have a favorite recipe for these? Hi Amy, I’m counting my macros and wondering if you have nutrition facts available for this slow cooker ground beef taco recipe. Thanks!